Out in Space is a good map with even more potential but partly fails due to lack of proper lighting. 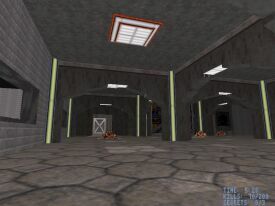 This relatively x-axis space map has a fair amount of details; only one or two rooms could have used a lot more detailing (the first warehouse room), but amazingly some areas seem to have no lighting effects at all (basically a crime) and the overall lighting level is too bright. This really is a pity since I really liked the way some of the rooms had been filled with quite original looking details and a good set of textures. Trimming is also easily above average. The map will take you around 20 minutes. There's a fair amount of monsters and plenty of bullets available. It's maybe 1/4 too long in terms of gameplay but that's a matter of taste. I'd have put a bit more effort into improving puzzles; the map relies too heavily on finding buttons from rather weird places. Another point concerning gameplay is space - there's plenty of room to do things (i.e., corridors are not cramped and there are plenty of open - but not empty - areas). Out in Space definitely shows potential and it's fun. However, it'd have been clearly better had its size been cut a bit and had more effort been put into giving each area proper lighting effects.